If $\theta_b$ is Brewster’s angle for light reflected from the top of an interface between two substances, and $\theta_b'$ is Brewster’s angle for light reflected from below, prove that $\theta_b + \theta_b' = 90.0^\circ$. This is College Physics Answers with Shaun Dychko. 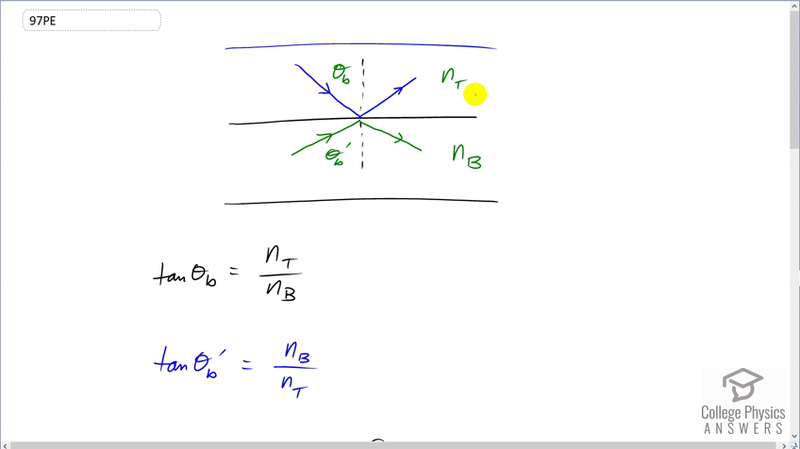 We have light incident through some medium that has an index of refraction <i>n</i> subscript ‘t’ for top and then it has some Brewster's angle <i>theta b</i> such that the reflected light is polarized. Now, if light were to approach this interface from the bottom and begin in this material with index of refraction <i>n b</i> and then reflect off of here polarized then we would call this Brewster's angle prime and our job in this question is to prove that <i>theta b</i> plus <i>theta b</i> prime is 90 degrees. So, we want to show that this is… this angle plus this angle is 90. Okay. So, tangent of Brewster's angle is the initial index of refraction divided by the final index of refraction and so for <i>theta b</i> it's going to be <i>n top</i> divided by <i>n bottom</i>. Now for the <i>theta b</i> prime, the formula will be <i>n b</i> because this is the material that it starts in, divided by <i>n t</i> which is the second material that it reflects off of. Now we can rearrange this <i>theta b</i> formula and solve for <i>n t</i> and then substitute that for <i>n t</i> in this expression here. So, we've multiply both sides of this by <i>n b</i> and we have <i>n t</i> is <i>n b</i> times tan <i>theta b</i> and then we substitute that in place of <i>n t</i> in this expression for a tan <i>theta b</i> prime. So, tan <i>theta b</i> prime equals <i>n b</i> divided by <i>n b</i> times tan <i>theta b</i> and the <i>n b</i>'s cancel leaving us with one over tan <i>theta b</i>. So, if we multiply both sides by tan <i>theta b</i>, we see that the product of the tangent of each of the Brewster's angles equals one. Now tangent is the same as sine divided by cosine so tan <i>theta b</i> is sine <i>theta b</i> divided by cosine <i>theta b</i> and tan <i>theta b</i> prime is sine <i>theta b</i> prime divided by cosine <i>theta b</i> prime and all of this equals one still. Now we have a trigonometric identity to replace some things with here. We have cosine of one angle plus another equals cosine of the first times cosine of the second minus sine of the first time minus sign of the second. And for this expression we can rearrange it to say that sine <i>theta b</i> times sine <i>theta b</i> prime equals cos <i>theta b</i> times cos <i>theta b</i> prime. And now since this from what we have in blue here, equals this, we can substitute for the sine term here. So, sine <i>theta b</i> times sine <i>theta b</i> prime equals all of this which then gets plugged into there and we have that cosine of the sum of these angles is cosine of the <i>theta b</i> times cosine of <i>theta b</i> prime minus the same thing which is zero. And so, if we can take the inverse cosine now of this side and of zero, and we have that <i>theta b</i> plus <i>theta b</i> prime equals inverse cosine of zero and inverse cosine of zero is 90 degrees. Quod Erat Demonstrandum, all done.